In recent years, International Electrotechnical Commission (IEC) in order to make consumers safer while using the electrical products, join more requirements to test in the standard. It makes electric to fit requirements by all tests be performed which are very complicated and different. The problem not only the course is complicated and apt to make mistakes, but also the manpower costs more. Chroma 19200 can perform high / low voltage switch and scan all safety tests by EST Analyzer (Chroma 19032) inputs such as withstanding test; Some modules support 20A for Leakage Current test and Function Test; GB & GBF modules support 40A and Ground Floating. Chroma 19200 can be installed in Chroma 8900 electrical equipment ATS for DUT which needs a lot of procedures to test like medical equipment, medical power, UPS, motor, etc., ATS can save the manpower cost , reduce the mistake, data management to improve quality and efficiency. Because different products have different requirements and test procedures, Chroma 19200 offers different scanning modules for combinations. 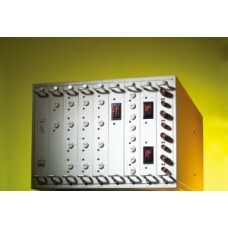 These modules are: AC LINE module, GENERAL module, AC LINE2 module. EARTH module, GB&GBF module and SWITCH module. Due to different modules have different functions, users are able to combine different modules for your needs. Most of products have to perform Electrical Safety Test (high voltage) and Function Test (low voltage). Chroma 19200 supports high and low voltage isolation by SWITCH module. User can combine high and low voltage tests like LCR measurement, power performance and function test for one sequence in one station and data collecting. That improves test efficiency and reduces occurred test risk.